My aunt was born in 1950 with spina bifida. The doctors determined early on that due to the rupture of the sac of her back, she would not survive. However, she defied the doctor’s prognosis and lived until the age of 60. Her life was not without obstacles, but she continually amazed our family as she learned to walk with braces, eventually work, and thrive in her community. Back then, across the US, there was a huge stigma associated with disabilities—even more so than we see today. And with that stigma came significant discrimination. 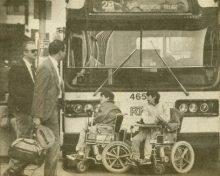 In July of 1978, Denver made headlines when a brave group of disability rights protesters came together just around the corner from the Denver Public Library at Colfax and Broadway. Men and women from ADAPT, known as The Gang of 19, held a sit-in and placed themselves in front of buses, protesting the fact that the city’s buses were not equipped for wheelchairs. The group blocked the intersection all day and night—the first in a long series of demonstrations that lasted for a year. Representatives of the Regional Transportation District (RTD) finally agreed to address accessibility issues and Denver became the first city to buy buses equipped with wheelchair lifts. Attitudinal barriers: people often only see disability when associating with people with disabilities. These barriers can be witnessed through bullying, discrimination, and fear. They include having low expectations of people with disabilities. These attitudes and ideas about disabilities contribute to other types of barriers. Environmental barriers: inaccessible environments, natural or built, create barriers to inclusion. Institutional barriers: many laws, policies, practices, or strategies discriminate against people with disabilities. As a result of the work done through the disability rights movement, especially from the 1970s through the 1990s, legislation in the US was passed to increase access to buildings and public spaces for people with disabilities. The design of city streets and sidewalks, requirements for ramps and elevators, additions of handicap parking and restroom stalls, and rules for new construction are some of the more visible changes we’ve seen in recent years to remove physical and environmental barriers for people with disabilities. Colorado’s disability rights activists continue to do important work to ensure people with disabilities have equal rights and access. Organizations like the Colorado Cross-Disability Coalition are pioneers in social justice, reminding us how important it is to make sure all voices are heard and considered in the design of our systems, policies, and communities. This applies to the health care system, too—for too long those who are most impacted by decisions about coverage, access, and care have been excluded from the decision-making process. The hard work and courage of people with disabilities who were willing to put their bodies on the line and make their voices heard has led to incredible progress for all of us. Thank you, to those whose efforts ensured my aunt had the opportunity to live a healthy life and continue the fight today.